People must face betrayals in their life and are very painful when they are betrayed, especially from the closed ones, such as: parents, spouses, children, brethren and friends. What must people do when they face betrayal? One of its benefits is that it helps people to recognize where is the true love to rely on. The prophet Isaiah advised people to look for God’s love because it is everlasting: “Can a woman forget her sucking child, that she should have no compassion on the son of her womb? Even these may forget, yet I will not forget you” (Isa 49:15). Today readings help us to be wise when we face betrayals. In the first reading, the prophet Isaiah showed us the Suffering Servant’s source of strength. Once he realized that he was cared for and protected by God, the Suffering Servant can face any adversaries and shall overcome all of them. In the Gospel, Jesus must face Judas Iscariot’s and all apostles’ betrayals; but he was very calm to announce the betrayals to all of them. Jesus was courageous and confident in handling these betrayals because he knew that God shall lead him to final victory. The prophetic mission of the Suffering Servant was to tell people what God wants them to do; if he didn’t listen and learn from God, he shall not know what to speak to people. He can’t give to others what he didn’t have. Therefore, the prophet must learn from God as much as he can so that he shall know how to help people to solve their problems according to God’s ways. Another task of the Suffering Servant is to learn how to suffer because he was sent to people who are having no knowledge or a little knowledge about God. Due to their limited or false knowledge, they shall behave in wrong or improper ways. This means that the Suffering Servant must be very patient in leading them to God because they can be indifferent, rejecting, and maltreating him. Therefore, he must learn how to suffer for their sake and be patient to lead them to salvation. We can see how Jesus, God’s Suffering Servant, fulfilled his mission during his life on earth, especially during his last week and Passion in this world. The Suffering Servant knew well that the worldly power can’t be compared with God’s power, so he confidently faced all worldly adversaries without fear because he knew that he shall have the final victory. Judas knew that the high priests wanted to kill Jesus, and he wanted to take advantage of the opportunity to earn money. Some said that Judas might think that Jesus shall use his power to overcome all adversaries; but if Judas listened to Jesus’ foretelling of his Passion, this should not be the case. We should learn a valuable lesson from Judas about the greed for money. It caused Judas to sell Jesus, his master, and his own soul (Judas later committed suicide by hanging himself). We should know that money is only a mean to help us to live; we should control it, not let it to control us. If we let money control our life, we shall be slaves of it, and we must get the same results as Judas. 2.2/ Jesus announced Judah Iscariot’s betrayal. (1) Announcing the betrayal: During the Passover meal, Jesus announced the bad new to his apostles: "Amen, I say to you, one of you will betray me." Jesus can let everything happen to him without his apostles’ knowing; but he chose to reveal the betrayal to them so that they were prepared to act when the betrayal shall happen. Moreover, this was Jesus’ last chance to meet all of his disciples before his death. (2) The apostles’ reactions: Deeply distressed at this, they began to say to him one after another, "Surely it is not I, Lord?" He said in reply, "He who has dipped his hand into the dish with me is the one who will betray me. The Son of Man indeed goes, as it is written of him, but woe to that man by whom the Son of Man is betrayed. It would be better for that man if he had never been born." Jesus’ announce didn’t point out who was the betrayer because all of them have dipped their hand into Jesus’ dish. According to God’s plan of salvation, there must be a betrayer for this plan to be successful. However, God didn’t predestine for Judas to be the betrayer because there are many betrayers who are ready to do as such. Moreover, even after Judas betrayed Jesus, he still had freedom to repent and to return to Jesus as Peter did; but Judas refused to repent. 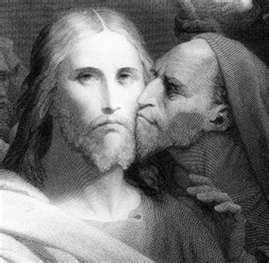 (3) Judas’ reaction: Then Judas, his betrayer, said in reply, "Surely it is not I, Rabbi?" He answered, "You have said so." Jesus didn’t want to accuse Judas with other apostles; but he needed to let him know the truth so that Judas might know that he couldn’t hide anything from him. Matthew didn’t report the apostles’ reaction. It might be that Jesus said this in a low voice that was enough for Judas to hear it. - Betrayals shall happen in our life. We need to be calm and to find our strength to face them. God’s love and strength shall help us to overcome these crises. - We can face all betrayals as long as we have God’s grace and protection. Judah Iscariot couldn’t handle it because he lost his faith and strength in Jesus. - We need to train ourselves so that we always have a firm faith in God. When we must face betrayals, we already had this source of strength; we can’t wait to such moments to look for faith and strength.